As your Representative, I began working on the issue of sexual assault in the military in 2007 when we learned of the tragic story of Lance Corporal Maria Lauterbach (USMC). Maria was a young woman from southwest Ohio who was serving her country honorably when she was allegedly sexually assaulted by a senior enlisted servicemember. Eight months later, she and her unborn child were murdered by that accused servicemember. Maria’s mother Mary Lauterbach, and Dayton attorney Merle Wilberding have been integral in helping me find legislative solutions to the many problems Maria faced in the military justice system. This past year, Congresswoman Niki Tsongas, of Massachusetts and I created the bipartisan Military Sexual Assault Prevention Caucus with the intent of educating Members of Congress on the serious problem of sexual assault in the military. In furtherance of this effort, the Caucus sponsored a screening of The Invisible War at the Library of Congress last February. Since that time it has been viewed by countless Americans, servicemembers, legislators and leaders in our Department of Defense and has received an Academy Award nomination for Best Documentary Feature. The nomination of The Invisible War is certainly welcome news and has been helpful in raising the awareness of sexual assault in the military. With the help of the Secretary Leon Panetta and leaders at the Department of Defense, we are currently working to implement several policy changes on dealing with sexual assault. This includes increased access to legal counsel, a provision in the 2012 National Defense Authorization Act, to maintain a victim-focused system. Recently, the United States Air Force announced the full implementation of new pilot program, which builds upon the right to legal counsel. 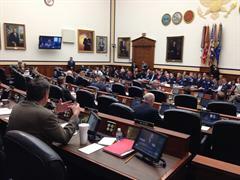 These recent changes along with years of work with the House Armed Services Committee have begun to change how this issue is dealt with inside our military. For far too long, the issue of sexual assault had gone unchecked. I must commend the efforts of Pentagon leaders, including Secretary Panetta, as well as U.S. Air Force Secretary Michael Donley and U.S. Air Force Chief of Staff General Mark Welsh for their continued efforts on behalf of our servicemembers. By combating the issue of sexual assault in the ranks, we are strengthening the morale and readiness of our bravest citizens. I hope through the story of Maria and The Invisible War, we can continue on a path towards ending the crime of sexual assault in our military. They need to not only address the problem of women raped in the military but those of us raped by them that are not in the service. All I have seen is all talk and no action from Congress. They need to demand and oversee investgations into past cases!